Dumbbell exercises are an excellent way to increase the intensity of your ab workouts. When regular crunches and other ab exercises become too easy, you need to find a way to challenge your muscles, and adding resistance to your abdominals is one way to further increase strength and break through plateaus. You can add resistance to your upper body by using dumbbells, and you can add resistance to your lower body by adding ankle weights. Dumbbells are a must have for any home gym, and a little goes a long way. 2, 3, and 5 pound dumbbells can add a significant challenge to your abs if you have not used any resistance in your latest routines. 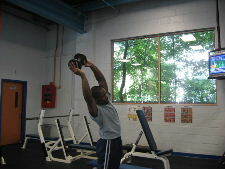 And of course, as you get stronger you can use heavier dumbbells. Here's a few of my favorite dumbbell exercises for the abs. Starting Position: Stand with your feet together and a dumbbell in one hand. Place your opposite hand behind your head. Form: Using your side ab muscles, lower the dumbbell towards the floor until you fell a comfortable stretch in the side opposite of the dumbbell. Hold for 1 second and then slowly return to the starting position. Personal Trainer Tips: You should feel the muscles working on the side opposite of the hand that is holding on to the dumbbell. Keep your body in a straight line and lean straight over to the side. Here are some additional oblique exercises. Starting Position: This exercise is performed in the same fashion as regular ball crunches. Lie of your back with your knees bent and your feet flat. Hold a dumbbell across your chest. Form: Exhale and curl your body forward lifting your shoulder blades off the ball. Hold at the top for 1 second and slowly lower to the starting position. Personal Trainer Tips: Holding the dumbbell across the chest will add an extra challenge to the ab muscles. This exercise also works your neck muscles so pay attention to the position of your head. Keep a space between your chin and your chest. If your neck becomes fatigued before you finish the set, simply rest for a brief moment and then finish the set. 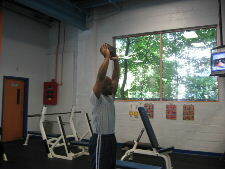 Starting Position: Begin by simply holding a dumbbell over your head while standing. Form: Inhale and slowly bend towards one side. Move as far as you can comfortably move. Hold for a brief second and then slowly bend to the other side. Personal Trainer Tips: This exercise is similar to the standing side bends with the dumbbell at your side. By placing the dumbbell over your head, you increase the lever and increase the challenge on your oblique muscles. Like the exercise above, this exercise will not magically get rid of love handles. Spot Reduction is the #1 Ab Exercise Myth. Starting Position: Begin by lying on your back with your legs straight in the air. Hold a dumbbell over your head. Form: Exhale and pull the dumbbell over your head and towards your legs. At the same time curl your upper body off the floor. Hold briefly at the top and then slowly return to the starting position. 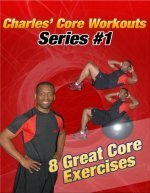 Personal Trainer Tips: This ab exercise has 2 parts, and this makes it a challenging ab exercise. Move in a slow and controlled manner. Perform 8-15 repetitions and then rest. Remember, when an ab exercise gets easy, you need to increase the intensity, and dumbbell exercises can help increase your core strength and get you over plateaus. Dumbbells are just one way to add resistance. The most important point to remember about strength is that it plateaus if you do not continually challenge your muscles. Dumbbell exercises can be used by themselves or with other abdominal exercises. Mix up your workout, until you find a combination that you like. Check out the Picture Directory of Ab Exercises to learn all the ab exercises on this website or try on of the free ab workout routines. Also visit my arm exercises website to learn all the best arm exercises with dumbbells and visit my leg exercises website to learn all the best leg exercises with dumbbells.